Welcome to LOOP! Research has shown that screen time among adolescents has a negative effect on the development of young children. 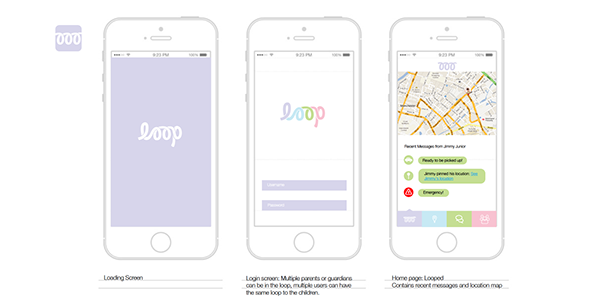 Loop was developed as an alternative to smartphone communications between children and their parents in order to reduce the number of screen-hours children are exposed to, while keeping connection constant between parents and kids. The goal of Loop is to let kids focus on the present moment without being pulled away by devices encouraging kids to develop the much needed social skills (play, communication, healthy habits, etc.) without the distraction and endorphin kick inherent to smartphones. 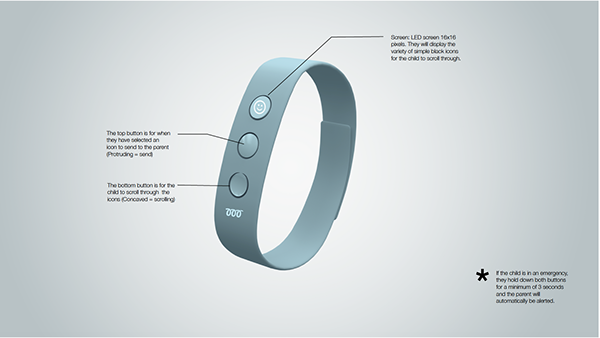 Loop is an app and wearable device that is meant to keep families and their children in contact and to stay in the loop with out the child’s need for a cellphone. Thinking about connectivity, my concept visually conveys the same. The logo loops around continuously in a way that a coil does, connected in one easy fluid motion. The look and feel is appealing to both adults and their children through the use of calm, yet youthful, pastel colors. Working with designers from Method, my assignment was to create the brand identity, product strategy, decision making framework, and product and service interaction models for a new product called Loop. 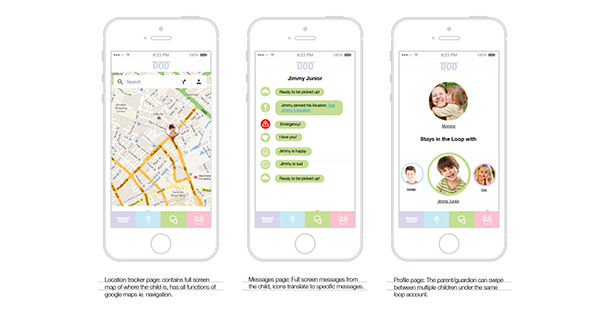 Loop is a simple wearable communication technology for children and parents to stay in contact without the use of screen time.